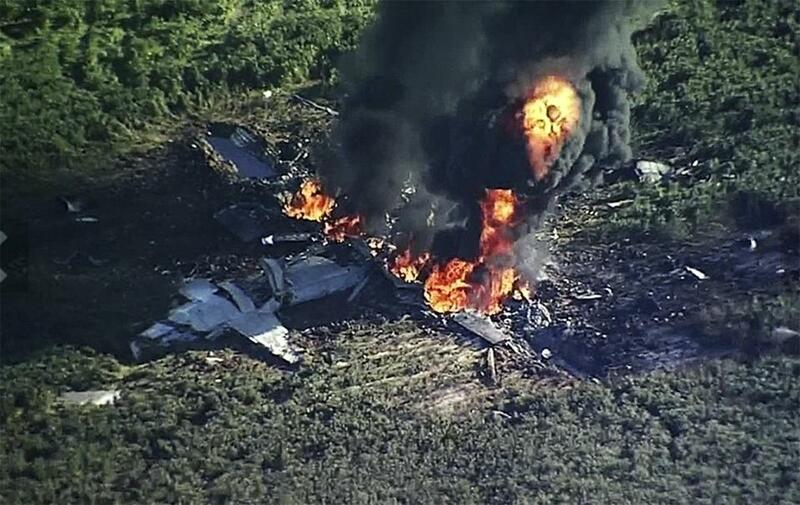 Smoke and flames rose from a military plane that crashed in a field near Itta Bena, Miss., on Monday. LEFLORE COUNTY, Miss. — A Marine Corps transport plane plunged into a soybean field in the Mississippi Delta, killing 16 service members and scattering fiery debris far across farmland and a rural highway, the military confirmed Tuesday. The plane was a KC-130 belonging to a Reserve unit, Marine Aerial Refueler Transport Squadron 452, or VMGR-452, nicknamed the “Yankees” and based at Stewart Air National Guard Base in Newburgh, N.Y., the Marine Reserve said Tuesday. The flight, which took off from Marine Corps Air Station Cherry Point in North Carolina, was headed to Naval Air Facility El Centro in California, the Reserve said in a statement. There were 15 Marines and one Navy corpsman aboard. The crash occurred around 4 p.m. in Leflore County, between the small towns of Moorhead and Itta Bena, about two hours north of Jackson, the state capital. Habig, 60, said he was airborne at the time and got a call from the sheriff’s department asking him to fly to the site to check out reports of an accident. Habig said he flew at 500 feet, maneuvering around a thick black column of smoke rising from the flames, and then descended to 50 feet to get a better look through the chest-high soybean plants. Just a few days earlier, he said, he had sprayed fields near the crash scene and had turned his plane over the very soybean field where the wreckage now lies. Military and local officials said the cause of the crash was unclear. The KC-130, a variant of the C-130 transport plane, is configured as a tanker for aerial refueling of other aircraft, but it can also be used to transport troops and equipment. The plane has a standard crew of four to six, though the number can vary. The C-130, a four-engine turboprop built by Lockheed Martin, is a workhorse of the US military, a reliable and highly adaptable aircraft, with many different variants in use. The first versions went into service more than 60 years ago, and more than 2,500 have been built. The model that crashed Monday was a KC-130T, a type built from 1983 to 1995 that is being phased out in favor of a newer model, the KC-130J. Among the active duty and reserve Marine units that fly KC-130s, only the one based at Stewart still uses that type, with 14 KC-130Ts. Many of the aircraft have their own personalities, and their tight-knit crews give them nicknames like “Storm Chaser” and “African Queen,” he said. “They have a life to them, and the crews really love them,” he added. The last crashes involving any types of KC-130 operated by the US military were in 2002 — one in Pakistan and one in California. The accident Monday was the worst military aviation accident in the United States in recent years, but far from the worst in history: In 1952, a transport plane crashed near Moses Lake, Wash., killing 87 service members. Edna Beavers was trimming the grass outside her house in Itta Bena on Monday afternoon when, she said, she glanced up and saw a huge plume of black smoke rising from a field about a mile away. “I was like, ‘Oh my God,’” Beavers, 68, said in an interview Monday night. Beavers said the plane crashed along County Road 547, a dirt road that connects acres of farmland between Itta Bena and Moorhead. There are few homes along the road, she said. A military jet later circled overhead, she said. “That is a sad situation there,” she said. “Melania and I send our deepest condolences to all!” the president wrote.